Inglert Builders cuts the ribbon, as new members of the Greencastle Chamber of Commerce, in front of their office at 1101 S. Bloomington St., also part of the Coldwell Banker Real Estate building. Formerly A+ Homes, Inglert moved to its location in the fall of 2009 and has been doing business in Putnam County for the past decade. Owner Jason Inglert, center, stands with his family, Tiffany, on the left, Laurisa, Jason II, Trenton and baby Trinity. The family owned and operated business does new construction and remodeling. For a free estimate, call Inglert Builders at 653-5500 during business hours from 9 a.m. to 5 p.m. Monday through Friday. Kaiden Tomasino enjoys a Sunday afternoon at Robe-Ann Park. With sunny skies and temperatures reaching 87 degrees Sunday, the park was full of families enjoying a Hoosier summer day swimming, walking, playing tennis or having a picnic. Malcolm and Beatrice "Bee" Wade will celebrate their 70th wedding anniversary on July 27. 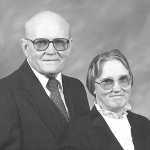 They were married in Lockland, Ohio on July 27, 1940, and immediately moved to Fillmore, where they resided until 1991. They have since lived at Prestwick in Avon.